In italiano combines highly effective language with an involving and informative introduction to Italy- its people, history, customs, and civilization. The colourful and illuminating video programs capture students’ attention and facilitate their comprehension of each aspect of language being presented. 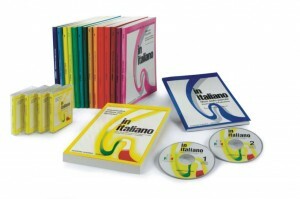 In Italiano goes far beyond grammar rules and drills. Both video and print materials make the students feel they are in Italy, seeing the country and experiencing true- to Italian-life – episodes that put their language learning into a meaningful and memorable context. It adopts a communicative-situational approach and introduces functional language at the Threshold Level according to the second language guideline established by the Council of Europe.